The first Capt. 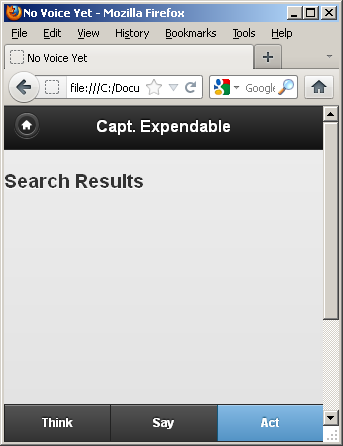 Expendable demonstration is built upon two very well written How-To pages and I would hate to duplicate them here. The first is a description of using JQuery Mobile Toolbars and the second is how to add the Voice Recognition plugin to PhoneGap. So instead, I will walk through the code elements in an order that you can follow along at home without needing a device. Lastly, the navbar needs to control the view; so let’s add the named DIVs so that NavBar will select one of these.